One of the recurring tropes in politics in Australia, as well as across the Western world, is the contested nature of the processing of refugees and asylum seekers, with many critics from the right declaring that the definition of refugees according to the UN 1951 Convention and 1967 Protocol being out of date in an era of global migration. Most recently Bob Carr, Australia’s Foreign Minister, has claimed that most people seeking asylum in Australia are ‘economic migrants’, but similar debates are occurring in Canada, New Zealand and the UK (where there is a Select Committee investigating the asylum seeking process). The Convention’s definition of refugee is very narrow, covering only those fleeing because of a ‘well-founded fear of persecution’… Western governments have consistently rejected calls from refugee organisations to extend the definition of ‘refugee’ in the Convention to include victims of war, civil war, natural disaster or serious disturbance… Even if the criteria were applied with care and generosity (which they are not), they would exclude those who have lost their family or home through war or civil war…; who have lost their home and their livelihood through forced resettlement… or the creation of military buffer zones. The result, Webber predicted, was that ‘[t]he number of people who, having not qualified under the strict definition of refugees… is to be severely reduced’. The last two decades have shown Webber’s predictions to be correct as the limited scope of the official definition of a ‘refugee’ has seen many within the Government, the immigration control system and the popular press view many people escaping immense hardships in their own countries as ‘bogus’ asylum seekers with no genuine claim to remain in Britain. [P]ublic opinion regarded the migrants as a mere pest. The new term ‘asylum-seeker’ rapidly acquired a sarcastic prefix: ‘bogus’. The British public came to believe that all migrants were false: none had a right to be here; all were helping themselves at our expense. There was sharp political pressure on the government to get tough. For far too many people across the world, this country is far too attractive a destination for bogus asylum seekers and other illegal immigrants. The reason is simple: it is far easier to obtain access to jobs and benefits here than almost anywhere else. That is the problem that these measures are intended to remedy. The measures introduced by the Conservatives were legislation, the Asylum and Immigration Appeals Act 1993 and the Asylum and Immigration Act 1996, which ‘applied harsh new measures to asylum seekers, designed to reduce the numbers arriving in Britain’. This focus on ‘bogus’ refugees dominated the debates on the 1993 and 1996 Acts in Parliament, with Emily Fletcher calculating that in Parliamentary debates on the 1993 Act, the word ‘bogus’ was used 53 times and 122 times in the debate on the 1996 Act. In May 1997, Tony Blair’s Labour Government came to power under the banner of ‘New Labour, New Life for Britain’ and similar to Wilson’s election in 1964 and 1974, many believed that a Labour Government would design a more ‘humane’ immigration policy. As Schuster and Solomos wrote, ‘[t]he election of a Labour government… led to expectations of an asylum policy more concerned with social justice than narrow national interest’. However this was not to be the case. Although New Labour may have softened the language utilised by the Conservatives (Fletcher notes that the word ‘bogus’ was only used 19 times in Parliamentary debates on asylum between 1997 and 1999) and spoke of ‘fairness’ and ‘social justice’ in immigration control policy, New Labour still focused heavily upon distinguishing between ‘genuine’ (and deserving) refugees and ‘bogus’ (and undeserving) asylum seekers. Labour’s 1998 White Paper, Fairer, Faster and Firmer – A Modern Approach to Immigration and Asylum, stated that ‘[t]he Government is committed to protecting genuine refugees… But there is no doubt that large numbers of economic migrants are abusing the system by claiming asylum’. The Government promised to assist ‘genuine’ refugees, but emphasised that ‘new arrangements are needed… which minimise the attractions of the UK to economic migrants’. The policy changes outlined in this White Paper formed the basis of the Asylum and Immigration Act 1999, which strengthened the Acts introduced by the Conservative during the mid-1990s and continued the bi-partisan dichotomy between the ‘bogus’ and ‘undeserving’ asylum seekers and the ‘deserving’ refugees. Many critics saw the Labour Government’s actions as a renunciation of its commitment to social justice and pandering to popular racism. However the architects of New Labour, such as Tony Blair and Jack Straw, had conceded the ground to the Conservatives on the need to detect and deter ‘bogus’ asylum seekers long before the introduction of the 1999 Act. In 1995, Blair declared, ‘We oppose bogus [asylum] applications and fraud and we recognise the need for immigration controls’, and a few months later, Straw admitted, ‘No one doubts the need to tackle the problem of bogus asylum seekers’. In Britain at the start of the twenty-first century, the government, state, media and public have intertwined in a mutually reinforcing and reassuring process to problematize and often stigmatise asylum-seekers. It is through this combination of anti-asylum sentiment finding legitimacy from the top down, alongside the sustenance provided by the daily press campaign and the encouragement of ordinary people from the bottom up, that enabled a poll carried out in February 2003 for The Times to suggest that the number of asylum-seekers was ‘the most serious problem in Britain at present’. ‘scrounger, sponger, fraudster, robbing the system’, ‘burden/strain on resources’, ‘illegal working, cheap labour, cash in hand, black economy’, criminal (unspecified or non-violent’, ‘criminal violent’, ‘arrested, jailed, guilty’, ‘mob, horde, riot, rampage, disorder’, ‘a threat, a worry, to be feared (terror, but not terrorism)’. These depictions of refugees and asylum seekers as undesirable, criminal and potentially dangerous, the report found, ‘imply that Britain is under attack from migrants, particularly asylum seekers and refugees. The report asserted that an outcome of this negative press reportage is the ‘potential to give rise to extreme feelings of fear and hostility’ and an ‘increase [in] the likelihood of harassment of asylum seekers and refugees’. 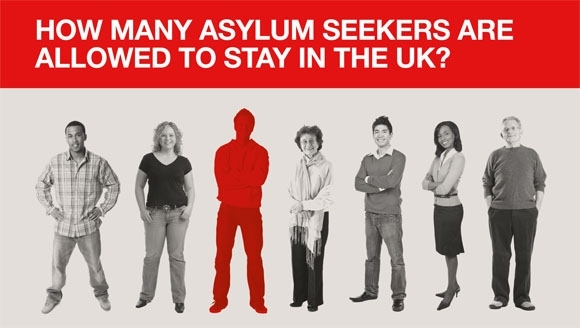 the asylum debate has become so distorted that the right to asylum in the UK is now under threat. Increasingly harsh government policy is eroding the protection we offer to those in need. British politicians are even talking about withdrawing from the 1951 Refugee Convention altogether. And this debate seems set to continue. 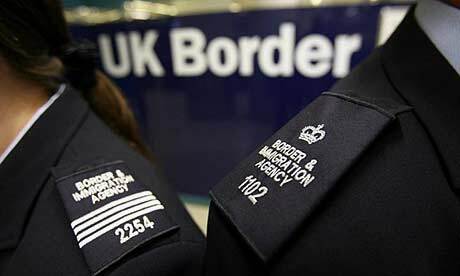 The Conservatives have proposed cracking down on ‘bogus’ asylum claims and limiting access that asylum seekers have to services, including legal aid, and on the other side of Parliament, there is little evidence that Ed Miliband’s Labour will move away from the immigration control policies of the Blair years, particularly as several key Labour MPs view the party’s ‘softness’ on immigration to be a key reason for their defeat in 2010. While the tabloids demonstrate the most explicit examples of this, that is not to say that the broadsheets and other media outlets are free from encouraging these negative depictions of refugees and asylum seekers. Majid KhosravNik has argued recently that ‘the Daily Mail generally perpetuates the existing known stereotypes and thus reproduces negative attitudes…, whereas The Times is more creative and refrains from reproducing the stereotypes explicitly’. But both newspapers ‘hardly recognise [refugees, asylum seekers and immigrants] using their names or other qualities, unless they can be positioned inside or adjacent to one of the negative topoi available, e.g. violence’. Majid KhosravNik, ‘The Representation of Refugees, Asylum Seekers and Immigrants in British Newspapers during the Balkan Conflict (1999) and the British General Election (2005)’, Discourse & Society, 20/4, 2009, p. 49; Italics are in the original text.